What’s a pyrometer and how did an early one work? Hairy Biker Dave Myers has made a BBC TV series (UK) looking at how old buildings are restored (July 2016). One programme featured restoration of the Wedgewood Institute in Staffordshire. Josiah Wedgewood, the famous potter, was also celebrated as the man who Revolutionised the ceramic industry by inventing the Pyrometer. It was able to measure the temperature inside a hot kiln and allowed the optimisation of the firing temperature. They showed the device, handled it, wondered at it and it’s inventor BUT, would you believe, they failed to say how it worked!! A pottery kiln needs to operate at a temperature very much hotter than any conventional glass thermometer used today can measure. It glows red, yellow or even white hot. To be able to measure the temperature, Wedgwood reasoned that you need to observe something that changes in some way with temperatures of that sort of magnitude. He first thought that colour-changing glass might work, but it didn’t. He then tried clay discs with iron oxide added. When fired these would change colour from beige to brown to black, depending on the temperature. But he thought that gases in the kiln would affect the colour and abandoned the idea. He finally came up with a solution. Uniformly shaped cylinders of pure Cornish clay were placed in the kiln. They would contract on heating and the contraction was a measure of the temperature in the kiln. On cooling, their shape wouldn’t change. 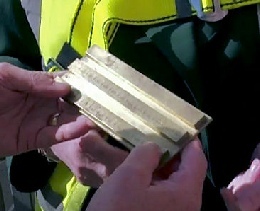 He devised a brass plate with a tapering groove to convert the contraction to temperature. The cylinder was moved along the groove till it stopped, and the temperature could be read off an engraved scale. And that’s what the Hairy Builder should have explained, but didn’t! Of course, other types of pyrometer followed. The Pyrometric Cone is a good example. 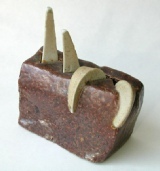 The cone, made of ceramics, was shaped with a long spike set at an angle. The hotter the temperature, the more the spike sagged and this was a measure of how hot it was. The more recent pyrometric cone was developed by Hermann Seger in Berlin. More modern pyrometers employ quite different principles. You can see the light and feel the heat from an open furnace. Why not measure them? 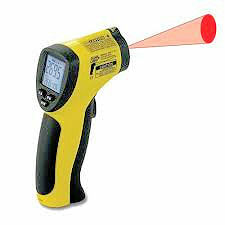 So you can measure the wavelength of the radiant heat from a distance. One early method involved looking through a special telescope at the inside of a furnace. The telescope had a glowing filament inside so you could see the filament against the inside of the furnace at the same time. The filament could be made hotter by increasing the electric current through it, thereby changing the colour of the radiant light it produces. 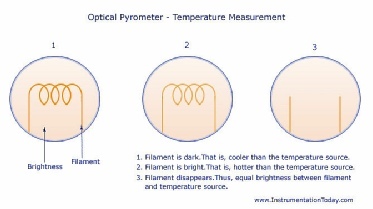 You could get a measure of the temperature of the furnace by heating the filament till it just disappeared ie. merged with the colour of the inside of the furnace. Modern pyrometers are automatic and often digital. They contain photo-cells and detect the wavelength of light, sometimes over different wavebands. Calibration allows the wavelength measured to be related to the temperature of the object. 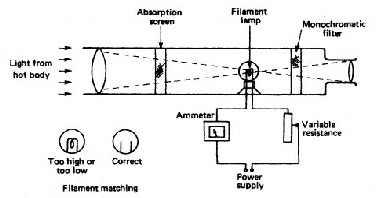 The red spot in the illustration is a sighting device to help position the detector in the required place.